If you’ve read any sort of science fiction, it’s likely you’ve heard about subvocalization, the practice of silently saying words in your head. It’s common when we read (though it does slow you down), but it’s only recently begun to be used as a way to interact with our computers and mobile devices. To that end, MIT researchers have created a device you wear on your face that can measure neuromuscular signals that get triggered when you subvocalize. 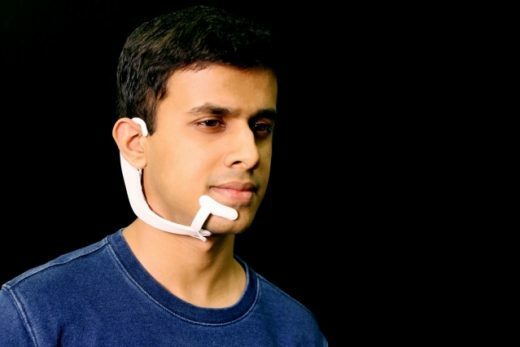 While the white gadget now looks like some weird medical device strapped to your face, it’s easy to see future applications getting smaller and less obvious, as well as useful with our mobile lives (including Hey Siri and OK Google situations). The MIT system has electrodes that pick up the signals when you verbalize internally as well as bone-conduction headphones, which use vibrations delivered to the bones of your inner ear without obstructing your ear canal. The signals are sent to a computer that uses neural networks to distinguish words. So far, the system has been used to do fun things like navigating a Roku, asking for the time and reporting your opponent’s moves in chess to get optimal counter moves via the computer, in utter silence.